Sergeant Detective D. D. Warren confronts the strangest case of her career in this exclusive eBook short story by the #1 New York Times bestselling author. D. D. Warren was pretty sure she’d seen it all. Then a man walks into police headquarters, attempting desperately to convince the squad that he’s dead. Explaining to him that he’s very much alive, they finally send him on his way . . . and then hours later, he turns up actually dead. And it’s on D. D. Warren to figure out how and why the dead man died . . . twice. Have you ever picked up one of these short e-books by Lisa Gardner? If not, they are incredible. It’s a snippet into little cases that could easily be a full book, but make great little novellas to tide you over while waiting for the next Lisa Gardner release. The Guy Who Died Twice is the story of a strange man who comes in stating he is dead. Not much later he turns up actually dead. D. D. and her team take on a Clue like mystery trying to decide who this rich man was and who killed it. Could it be the butler? The lawn boy? The maid? How did they do it? I love how this felt like playing a game of clue. It really got me into the story. I felt involved in the investigation right alongside my girl D.D. I found all the characters to be mysterious and had me questioning their motives and if they had the opportunity. As usual, Gardner’s writing style is intense, elusive, and keeps you on the edge of your seat the entire time. She gives you just enough information to make you think you’ve figured it out when really you are not even close. Definitely pick it up on Amazon or Barnes and Nobles. It’s inexpensive and a quick, fun… bloody read. 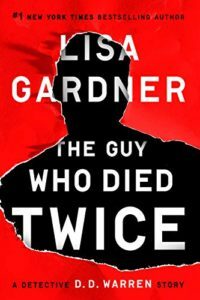 Pick up your copy of The Guy Who Died Twice on Amazon and Barnes and Noble. You can also add it to your To Reads list on Goodreads and leave feedback for the author when you are finished. Check out more from author Lisa Gardner on her website HERE, including her upcoming novel Never Tell, available February 19th. Check out our review of it here!